Phil Mosely Soccer in New South Wales, 1880–1980 has just been published by Sports and Editorial Services Australia and Vulgar Press, Bannockburn and Carlton, Victoria. It is available from all good booksellers via Dennis Jones and Associates at a recommended retail price of $39.95. It began in 1880 when The Wanderers trotted onto Parramatta Common. Thereafter immigrants, locals, miners and workers have combined to shape soccer into what has always been the code’s premier state in Australia. Over time the game progressed from paddocks to stadia but the quest for players and patrons, money and media was as difficult as protracted. There were such problems as Depression, war and the rivalry of other codes. There was also a dominant culture so often unmoved by a game it deemed to be foreign. 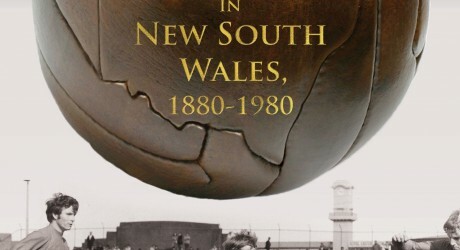 The first 100 years of soccer in NSW is a story previously untold. This book plots and unearths how the ‘world game’ has fared in antipodean soil. Phil Mosely has played, coached and managed, just not for Manchester United or the Sydney Wanderers. An academic historian by trade, his doctorate was followed by Ethnic Involvement in Australian Soccer and the co-edited Sporting Immigrants. A young, growing family and The University of Melbourne’s Queen’s College proved distracting but finally, upon the urgings of Ian Syson and Roy Hay, Phil decided to publish this book, his original University of Sydney doctorate.